The Radiation Assessment Detector, one of 10 instruments on board the next rover mission to Mars, is now collecting data during the long journey to the Red Planet. RAD, the only instrument scheduled to collect science data en route, will measure fluxes of solar energetic particles and galactic cosmic rays from inside the spacecraft in preparation for future human missions to Mars. Southwest Research Institute leads the RAD investigation on the Mars Science Laboratory, which launched Nov. 26. The MSL rover will arrive at Mars in August 2012 to assess the planet’s past and present habitability. The Radiation Assessment Detector, the first instrument on NASA's next rover mission to Mars to begin science operations, was powered up and began collecting data Dec. 6, almost two weeks ahead of schedule. 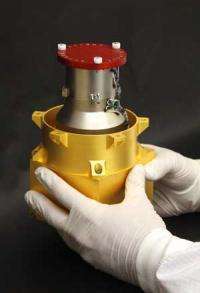 RAD is the only instrument scheduled to collect science data on the journey to Mars. The instrument is measuring the energetic particles inside the spacecraft to characterize the radiation environment an astronaut would experience on a future human mission to the Red Planet. "The first data packets from RAD look great," said RAD principal investigator Don Hassler, science program director in the Space Studies Department at Southwest Research Institute. "We are seeing a strong flux in space, even inside the spacecraft, about four times higher doses of radiation than the baseline we measured on the launch pad from the RTG, or radioisotope thermoelectric generator, used to power the rover. It's very exciting to begin the science mission." The Mars Science Laboratory, launched Nov. 26, will land a sophisticated car-sized rover called Curiosity on the surface of the planet in August 2012. Loaded with 10 instruments including RAD, Curiosity will traverse the landing site looking for the building blocks of life and characterizing factors that may influence life, such as the harsh radiation environment expected on Mars. "RAD was designed for the science mission to characterize radiation levels on the surface of Mars, but an important secondary objective is measuring the radiation on the almost nine-month journey through interplanetary space, to prepare for future human exploration," said Hassler. "RAD is an important bridge between the science and exploration sides of NASA." RAD will measure the relevant energetic particle species originating from galactic cosmic rays, the Sun and other sources. Of particular interest are the particles accelerated by coronal mass ejections on the surface of the Sun, which spew fast-moving clouds of radiation across the solar system. "Not only will this give us insight into the physics of these giant clouds, but as particles from these clouds hit the spacecraft, an inward cascade of secondary particles is released inside the capsule, which could pose a potentially greater biological hazard," said Hassler. "Like an astronaut, RAD is tucked inside the spacecraft for the journey and will characterize these secondary particle showers. RAD also measures the higher energy galactic cosmic rays and the secondary particles that they produce inside the spacecraft." RAD will collect data nearly continuously during cruise and will downlink data every 24 hours. Positioned in the left center of the rover, the instrument is about the size of a coffee can and weighs about three pounds, but has capabilities of an Earth-bound instrument nearly 10 times its size. RAD detects charged particles arriving from space and will measure neutrons and gamma rays coming from Mars' atmosphere above, or the surface material below, the rover. Nice to see some early benefits from the probe. I think the radiation information may help them quantify how much cumulative and peak spot radiation they can expect, but I don't think it will actually help them with materials or design research, or improve the properties of a radiation shield. Now what it MIGHT do is help them Optimize their designs from a protection/weight view, allowing them to use existing or new technology developed independent of these readings in the most effective way, Using the minimum amount needed for a reasonable amount of protection. I'm very curious about surface radiation on Mars. I want to know the difference between Mars vs Earth and Mars vs Interplanetary Space. Space gets a healthy dose of any kind of radiation, primarily from the sun, but also other sources. This amount of radiation can vary quite a bit based on the sun cycle and solar storms/flares. Mars is exposed to much less radiation than the earth (Being farther from the sun) but it lacks the protection of a magnetosphere or thick atmosphere. Also, because of it's composition, it is better at shielding you from infrared than UV or Xrays. But it is significantly safer than space. On mars, there is enough protection that you could build a 'safe' base on the surface, but enough radiation that it would be easier to build it underground due to the amount of shielding you would need. An astronaut mission would last for a limited duration, so higher radiation levels are more acceptable. Also - a mars mission is at the limit of our technological ability to 'safely' shield the astronauts. Anyone who goes on that mission is basically guaranteed cancer later in life, just like the majority of the apollo astronauts. The last radiation is free neutrons. They are absorbed by the earth's atmosphere, but I am not aware what level of risk you have for neutron radiation in space or on mars.